Our Nixon takes audiences on an intimate journey inside the White House during the presidency of Richard Milhous Nixon. The 84-minute documentary begins in 1969 with the inauguration of Nixon as the 37th President of the United States, and concludes with him resigning in 1974 in the wake of the Watergate scandal and the threat of impeachment by Congress. The independent film was co-produced by director Penny Lane and Brian Frye under the label Dipper Films. Primary content is seen through the eyes of Nixon Administration Chief of Staff H.R. Haldeman, Domestic Affairs Advisor John Ehrlichman and Special Assistant Dwight Chapin, who documented their experiences with home movies recorded on Super 8 film. The documentary provides unique insights into the character of Nixon and his staff as well as the issues of the times. A short list of the home movies includes Nixon watching television images of lunar landing of the Apollo 11 astronauts; anti-Vietnam War protests outside of the White House; the 1969 inauguration ceremony; Nixon and his wife, Pat, announcing that their daughter Tricia is engaged to be married; and film of him dancing at her wedding. There are images of Nixon meeting with Premier Chou Enlai and attending a ballet with Chairman Mao Tse-Tung, head of the communist party, during a visit to China. There is also Super 8 film of Nixon meeting with the Pope in Rome. The Super 8 film was archived at the Nixon Library in Yorba Linda, California and at the National Archives and Records Administration (NARA). There is also content edited from archived television news film and almost 4,000 hours of White House conversations recorded on audio tape. One example: Chapin talking about Nixon wiping tears from his eyes as he wrote notes to the parents of soldiers killed in Vietnam. There is news film of former US military analyst-turned-whistleblower Daniel Ellsberg at a rally calling for Nixon to stop the bombing in Vietnam. There are news film images of Vietnam War veteran—and current Secretary of State—John Kerry making an anti-war speech. 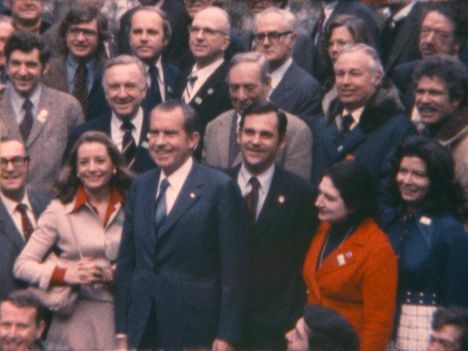 Other archived news film includes journalists Dan Rather, Walter Cronkite, Barbara Walters and Mike Wallace talking about Nixon and his administration. The documentary aired on CNN network earlier this month, and makes its theatrical debut August 30 through Cinedigm. Our Nixon is the first feature-length documentary credit for both Lane and Frye. Lane has been producing and directing nonfiction and essay films since 2002. Frye is a law professor who has produced a few experimental films. "I met Penny about 10 years ago," Frye recalls. "I had heard about the home movies taken in the White House. We agreed to explore the possibilities of producing a documentary looking back on the former president based on the home movie footage." "Too much history is shaped by people writing or speaking about it," Lane observes. "Brian and I agreed that going back to the primary source is the best way to experience history as it was lived. We watched the home movies, TV interviews and news clips and listened to oral histories recorded on the White House audio tapes. "Our Nixon is not an attempt to write a tied-up history with only one ultimate meaning," Lane maintains. "Nor is it an attempt to convince you of my point-of-view. Rather, the film asks audiences to sift through the fragments of history in order to reach their own conclusions." Some 26 hours of Super 8 film was found in Ehrlichman's office after he resigned. It was converted to 16 mm color internegative stock at 18 frames per second at NARA. Lane and Frye contacted NARA in 2010 and arranged to make a telecine copy at standard definition. In 2011, they heard that the Nixon Library in Yorba Linda, California, had another set of the collection. They met with Ryan Pettigrew, the archivist at the library, and discovered these were the original films, obtained from the Haldeman estate. "We offered to pay for an archival-quality scan at 4K resolution," Lane says. "We hired Jeff Kreines, who invented the Kinetta film scanner, to travel to the Nixon Library. He scanned every frame at four times the resolution of HD video and delivered the content to us as digital Cineform files at the native 18 frames per second." "Our collection consists of 55 original, 400-foot-long reversal film reels, each of which consists of shorter reels edited together during the Nixon administration," Pettigrew says "They were donated by Haldeman's wife. There is another collection of Super 8 reels that is referred to as the 'White House Staff Super 8 Collection.' These films were found in John Ehrlichman's office during the Watergate investigation. "The second collection consists of 55-second generation prints on seven-inch reels," Pettigrew continues. "For the most part, they mirror the Haldeman collection. It is evident that Haldeman made some edits in the years following the Nixon Administration. There are 94 reels in the Ehrlichman duplicate set that were not compiled. There are separate 50-foot reels on three-inch hubs. Most of them appear to be second-generation contact prints. The location of the original reels isn't known." The documentary was edited by Francisco Bello, who earned Oscar and Emmy nominations for Salim Baba in 2007 and an Emmy nomination for War Don Don in 2010. "The reactions have been really positive," Frye says. "My impression is that a lot of people weren't sure what to expect. When they see the film, they are pleasantly surprised by how interesting, intimate and personal the movie is. Nixon and his staff members were almost comically square in a way—sometimes a little silly in a creepy way, but still funny. 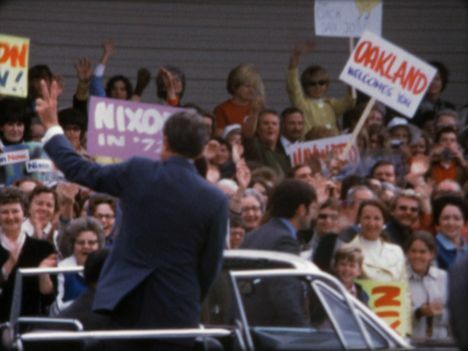 "I think the film gives audiences insights into the Nixon presidency," Frye continues. "We tried our best to represent that as accurately as we could. You have to remember that Nixon was elected by a significant majority of votes; that paints a picture of what America was like and what people cared and were concerned about. It's important for people in my generation to fully wrap their heads around that part of history. This film is kind of tactile, first-hand way of experiencing it. "Obviously, archived images are a great resource," Frye asserts. "We need more people to appreciate how to use archive material in thoughtful ways to educate future generations about the past. Unfortunately, I don't think we will ever see this happen again. No president after Nixon allowed the documentation that took place during his regime. The level of documentation that the Nixon Administration encouraged and facilitated won't happen again. They are going to want control over what's recorded and how the administration is represented. "Ryan Pettigrew was hugely helpful," says Frye. "He is really a hero in the making of this movie. He told us that the Nixon Foundation had just given the Nixon Library the original Super 8 film that they received from Mrs. Haldeman. The difference is stunning. The sharpness is incredible." Preservationist Milt Shefter observes, "It is important for documentarians to be able to tell history-based stories using visual and aural records of the past. We should all be concerned that the transition from film to electronic news reporting will limit that capability in the future." Shefter and Andy Maltz collaborated on researching and writing the The Digital Dilemma Two archiving report sponsored by the Academy of Motion Picture Arts and Sciences that was published in 2012. The report focuses on the archival status of independent American narrative films and documentaries. It is available on the Academy website. For an article about The Digital Dilemma 2, click here. Bob Fisher has written more than 2,500 articles about narrative and documentary filmmakers over the past 50 years. He has also written extensively about the importance of archiving yesterday and today's films for future generations. Vinnie Malhotra is senior vice president of development and acquisitions for CNN. Documentary spoke with Malhotra about how CNN chose Our Nixon and other independently produced documentaries to air. Documentary: Is CNN showing more documentaries than it has in the past? Vinnie Malhotra: CNN and a few other networks are showing more documentaries. The marketplace for high-quality documentaries has become incredibly competitive. D: How do you decide what documentaries to air? VM: We consider airing documentaries for various reasons. We look for documentaries that take us beyond what we know about important issues. Questions that we ask ourselves include whether the film tells a deep story about an important subject, and is it high quality. In the case of Our Nixon, what was so compelling was that it wasn't just another film about Watergate or the Nixon administration. It is one of the most creative approaches to telling the story of the Nixon Administration and politics, in general, that any of us had ever seen. The fact that Penny Lane didn't shoot a frame of film, but managed to piece together such an incredible story from archives was wildly eye opening for us. D: Can you give us another example? VM: Steve James is working on Life Itself, a documentary about Roger Ebert. The executive producers are Martin Scorsese and Steve Zallian. We got in very early with that project. Roger Ebert and his colleague Gene Siskel are populist film critics who changed how we speak and feel about movies. They found a rightful place in American pop culture. D: How do filmmakers get CNN interested in their documentaries? VM: Anyone can propose projects at any stage of development. Courtney Sexton plays an important role. She recently joined CNN as a senior director. Courtney has been working with Diane Weyermann at Participant Media for the past six years.